One of the most famous stories surrounding Van Gogh is that the artist cut off his own ear in December of 1888, shortly after a violent argument with his friend and fellow artist Paul Gauguin. Reportedly, Van Gogh then gave the ear to a local prostitute, a woman named Rachel. Due to the popularity of this story, I think that Self Portrait with Bandaged Ear (c. 1889, shown left) is one of the painter's best-known self portraits. 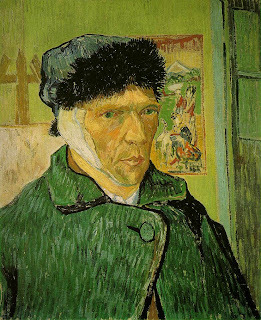 An interesting (and rather incredulous, in my opinion) theory came out earlier this year about Van Gogh's ear cutting. You may have caught wind of this new theory - in May it was picked up by all different newspapers and sites. Hans Kaufmann and Rita Wildegans' new book, In Van Gogh's Ear: Paul Gauguin and the Pact of Silence argues that Van Gogh did not cut off his own ear, but rather Gauguin was the culprit. Kaufmann and Wildegans believe that Van Gogh and Gauguin were fighting about Rachel (the prostitute). According to this theory, the men agreed to invent the story of self-mutilation so that Gauguin would not get in trouble with the authorities. Gauguin eventually moved to Tahiti and Van Gogh committed suicide in 1890. You can read more about this new theory in these articles by the Daily Mail and BBC News. Personally, I have a hard time accepting everything put forth by Kauffman and Wildegans. I kind of like the idea that Rachel was the source of the argument, especially since we know that Van Gogh gave Rachel the infamous ear afterwards. However, I'm not sure that Gauguin would have been the one to slice Van Gogh. I agree with what Jonathan Jones wrote to attack this theory. After Gauguin left, he wrote Van Gogh and asked for the Sunflowers painting a parting memorial gift. I don't think Gauguin would have had the gall to ask for a momento if he had recently cut off his friend's ear. That doesn't make sense to me.